There’s no better way to enjoy game day than with your favorite team and your favorite snacks. 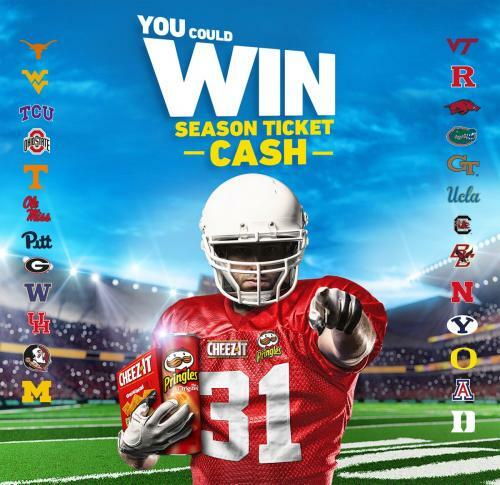 That’s why Kellogg's®, Cheez-It® and Pringles® have teamed up to give fans the chance to win up to $10,000 in season ticket cash* to see their favorite team live! Now through April 15, purchase select Kellogg's®, Cheez-It® or Pringles® products and enter at KelloggsFamilyRewards.com for your chance to win. Additionally, Kellogg’s has partnered with 25 NCAA schools and, at all home games, will be bringing additional fun to the stadium including seat upgrades to the best seats in the house at select games. Look out for our fan activation zone at college football games around the country this fall and be sure to pick up Kellogg's®, Cheez-It® or Pringles® for your next game day. No Purchase Necessary. Open to legal residents of the fifty (50) United States and District of Columbia who are 18 years of age or older at time of entry. Begins at 12:00:00 PM (ET) on 8/1/17 and ends at 11:59:59 AM (ET) 4/15/18. For entry methods, prize details, odds of winning and complete Official Rules, go to www.KFR.com/BestSeats. Subject to complete Official Rules. Void where prohibited. Sponsor: Kellogg Company, One Kellogg Square, Battle Creek, MI 49016. ®,™, © 2017 Kellogg NA Co.